December 11, 2017 December 11, 2017 - by Ilda - 18 Comments. Jover Laurio, the blogger behind Pinoy Ako Blog has filed a libel suit against social media personality Franco Mabanta. How do I know this? Well, no less than Rappler Chief Executive Officer Maria Ressa tweeted an article published in her own site about it. That’s right, folks. People like Ressa seem to think Laurio is “news worthy” and that the public needs to know what’s happening in her life. Who the hell is Laurio and why do we need to be updated about her life? Just a couple of months ago, she was anonymous until blogger RJ Nieto of Thinking Pinoy outed her. And then she was forced to admit she is the blogger posting nasty stuff about Philippine President Duterte, his allies and supporters. Since being outed, she has been crying persecution and claiming that Duterte’s supporters want to silence her just because she is very critical of the President. It seems Ressa, who likewise accuses Duterte supporters of attacking her and Rappler has found a person to rally behind and use in her fight to “take the Internet back”. Apparently, Laurio is suing Mabanta for his Facebook posts where he made fun of her appearance. 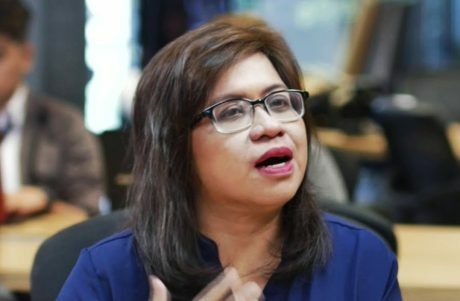 Mabanta referred to Laurio as an “Ogre Lady” and “profoundly disgusting”. While I do not condone personal attacks especially those that mock someone’s physical appearance, Laurio is guilty of doing exactly that before her identity was made known. She quite often made fun of Duterte’s appearance and that of his die hard supporters. One of them is former Assistant Secretary for Department of Social Welfare and Development Lorraine Badoy. Laurio accused Badoy of having undergone facial enhancement and said that Badoy wasn’t pretty before she had it done. But after photos of Laurio were exposed, it had become evident that she herself could not stand criticism from other people who comment about her physical appearance. Until today, I had no idea a person can be sued for commenting on another person’s looks or physical appearance. I always thought that calling someone “ugly” and “hideous” fell under the “opinion” category. Personally, I think that if someone thinks you are not easy on the eyes, it would be hard to convince that person otherwise. As they say, beauty is in the eye of the beholder. You can simply take his opinion with the grain of salt. At least that is what I would expect from someone who has breeding. There is something to be said about people who think those who comment on their physical appearance should be taken seriously. The terms “full of herself” and “delusional” come to mind. I am very curious to see what the outcome of Laurio’s lawsuit will be and how the court will deal with this. How can her lawyer – no less than the former Solicitor General Florin Hilbay – prove that an opinion can cause damage to a person? It would be interesting to see HIlbay use his skills to convince the judge that Mabanta’s posts were false considering it is his own belief. Laurio should also be careful about the way people like Ressa and Hilbay are coming to her defense. They could be using her to get back at Duterte’s supporters. Or perhaps it should be Ressa and Hilbay who should be careful. Laurio could be using them to get back at Duterte’s supporters who criticized her. People like me who are mere spectators of this “sport” can already tell these characters are just using each other to advance their own personal agendas. Meanwhile, we all have to bear with the lack of substance in Philippine news and current affairs courtesy of sites like Rappler. Previous Article Today is International Human Rights Day, but is “human rights” really an international thing? LOL Paano kaya yung right to freedom of speech ni franco mabanta? hooman rayts at work, baby! If calling someone “ugly” is harassment, then court dockets would have thousands of these cases already. Or it’s what I said earlier… “if you don’t agree that I am beautiful, then you are oppressing me! Tang ina mo! I will sue you!” Ah, vanity of vanities, all is vanity. …and if the case made it to court? The accuser will be presented as evidence to validate the statement of the accused? The judge should ask for advice from the Miss U judges on criteria to use for her verdict. Sure, why not. Maybe, what is Beautiful to me; could be Ugly to you…as they say: is is in the Eye of the Beholder. I have not seen Miss Laurio in person. However, I would advice her ,to go to a plastic surgeon like : Dr. Bello, to get a retouch on her face. This could make the difference. Instead of suing somebody, because they don’t agree with your physical appearance. Maybe Ms. Reesa, and Mr. Hilbay, need a retouch , also on their faces, by Dr. Bello. I would like to see the decision of the Court, if this case is heard in Court. Maybe, it would go to Higher Courts, like the Supreme Court. It will be a very important decision ! Wait, is Jover Laurio is a propagator of political correctness in the Philippines? Whoa, this is stupid. Laurio’s move would give rise to Pinoy SJWs, more stupider than their American fellows. Miss Laurio my unsolicited advice, accept the fact if you really have an ugly face. It is an act of humbleness and being humble is an act of good manner and right conduct which is many times more appreciable than the physical beauty. However, if you are really anxious about physical beauty you can always do like Xander Ford. She’d do herself a big favor by losing some weight. A lot of Filipinos MAKE themselves ugly with a relentless diet of rice, rice, cakes with rice, and more rice. She’d probably be ordinary-to-attractive if she didn’t look like an underinflated balloon. I’ve noticed this kind of thing is not unusual. Pinoys are always threatening to ‘file a case’ against each other for ridiculous things … and if they can afford it, they actually do. Lawyers are perfectly happy to take their money and waste everyone’s time. It’s no surprise the courts are clogged with trivial nonsense and can’t deal with important things. Meanwhile, Filipinos find it impossible to resolve their differences in ordinary, human ways because they’re so focused on causing the maximum amount of trouble for everyone, including themselves. Ah well … “pinoy ako”, at least she’s upfront about it. The expression “get a life, people” springs to mind. Don’t Filipinos have more important things to worry about? Yes, they do have more important things to worry about: file libel cases against people who do not have more important things to worry about. This way you give them more important things to worry about, like, defend themselves in court. 1) Hurt someone – anyone – as much as possible. 2) Waste as much of my own time as possible. 3) Waste someone else’s time. 4) Go to church and ask for forgiveness. 956) Learn how to do my job. 1,543) Aspire to be a better person. You guys are all UGLY! There I said it, so sue me! Seriously though this is a new low for them. It is childish and petty. I wouldnt be surprised if she had a case. In a country where adultery is still seen as a crime, and where harmony is as valued as high as being a virgin, I wouldnt be surprised if even she wins the case. I can just imagine the possibilities on what comes next. This is probably what the locals mean by their claim “it’s more fun in the Philippines”. You don’t get this much awkward entertainment anywhere else in the world. In a country that doesn’t discriminate between fame and infamy, the latter presents itself as plainly more achievable. All things are beautiful…for GOD CREATED THEM ALL !! !